3D virtualization applied to museums allows us to develop new ways of documenting, studying and disseminating their collections, as we have seen on other occasions. From now on, a new museum joins the network of virtual collections accessible in 3D through Sketchfab, composed of more than 600 cultural institutions among which I am pleased to have created some such as the Museo Arqueológico Nacional de España (Madrid, Spain) or the Museo Archeologico Nazionale di Napoli (Naples, Italy) and having collaborated in many more. Vilamuseu is the museum of Villajoyosa, a small city in the coast of Alicante in Spain. Directed by Antonio Espinosa Ruiz, it has started a firm and convinced path towards a very present future in which its pieces will be more accessible than ever. The virtual collection of Vilamuseu will begin with eight pieces created by Sketchfab Master Néstor F. Marqués, including an iberian falcata (native Spanish iron sword type from 2000 or more years ago), small Egyptian amulets and a lead ingot of the Roman wreck Bou Ferrer. The pieces will be available in a staggered way on their official Sketchfab profile, which you can now follow. 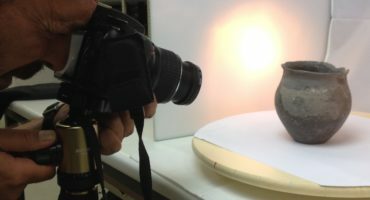 This institution, fully dedicated to accessibility by integrating numerous resources that allow people with disabilities to enjoy their collections in a complete way, adds an important additional element to their exposure thanks to the photogrammetric documentation of their pieces: the use of 3D printing. 3D printing, also made by Néstor F. Marqués, allows us to discover the pieces with new senses. The virtualized pieces have been reproduced to allow people with visual disabilities to enjoy the heritage in a new way, understanding that despite not being able to touch the original pieces, they will be feeling high geometric precision replicas. 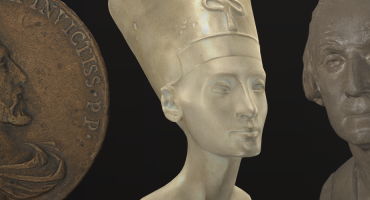 This technology is capable of reproducing 3D models in real size or even on a larger scale, as is the case with the Egyptian amulet below. It is a piece so small that it is difficult for any visitor to understand its interesting iconography. Its reproduction, twelve times larger than the real piece, printed in PLA recyclable plastic and hand-painted in the museum’s restoration laboratory, achieves complete integration when it comes to understanding the whys of its protective symbols. Any visitor, not only blind people, can touch, experience and understand objects better with 3D printed replicas. The case of a spectacular iberian falcata 60 cm/23,6 inches long is also remarkable, since it is a very fragile but very interesting piece. By being able to grasp it, it is possible to better recognize its characteristics and physiognomy, difficult to understand for the blind through a mere description. Here you can see two replicas as they are after the 3D printing process from the high resolution photogrammetric model. 3D printing opens up a new world of possibilities that begin by applying 3D virtualization technologies to heritage. 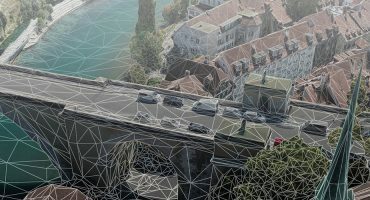 Both technologies -photogrammetry and 3D printing- have even more applications if possible when we focus on accessibility to heritage, entail a revolution for visual and haptic access, especially in the case of small or very large objects, by allowing changes of scale to increase or decrease the pieces. If you want to know more, make sure to check out my Sketchfab profile as well as that of Vilamuseu and follow us if you like it. The rest of the collection will be made public soon.